Posts will be less frequent during the general election period: https://alberta.ca/election. Although snow remains in the backcountry, areas of exposed dry grass around Rocky Mountain House pose a significant wildfire risk. As a result, a Fire Advisory is now in effect for the Rocky Mountain House Forest Area section of the Forest Protection Area (FPA). Existing fire permits remain valid (subject to suspension or cancellation). New fire permits will be issued on a case-by-case basis. Off-Highway Vehicles can start wildfires – check frequently to ensure hotspots are free of debris, and make sure mufflers and spark arrestors are working properly. Never leave a campfire unattended. Soak it, stir it and soak it again until cool to the touch to ensure it is extinguished. The Fire Advisory will remain in effect until conditions improve. For assistance, call 310-0000 or send a direct message. 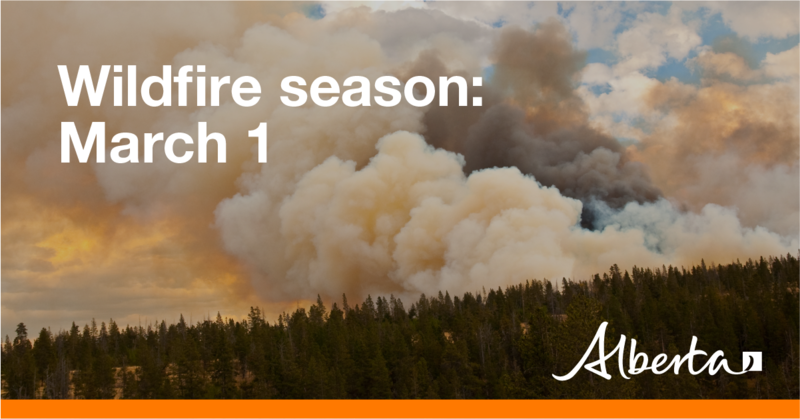 In Alberta, wildfire season starts March 1. This means fire permits are required for any burning in the forested areas of the province with the exception of campfires. Fire permits are free and available from the Agriculture and Forestry office in Rocky Mountain House. Call 403-845-8272 for more information. During the 2018 wildfire season, there were 57 wildfires in the Rocky Forest Area that burned a total of 2,880.65 hectares.